That's right. Steve has turned over the controls for issue #29 to me, Jeff Koke. Well, first off I should say that, yes, we know this issue is late . . . okay, really late. It has to do with a lot of things, actually. Steve has been writing all the time lately. First it was Ogre Miniatures, now Hot Lead. To compound that, he's also been out of the office (and out of the country!) for weeks at a time. Obviously, Steve hasn't had time to do the editing and writing needed for this magazine. So he decided to pass the editing of the magazine to me for this issue. But just then, I got caught up in one crisis after another. Ah, well. So it goes. GenCon 1992 was our best con in years. It was my first gaming convention, and frankly, I was impressed. It's nice to see so many people interested in the type of products we produce, and specifically our products. It was also a pleasure to finally meet the people that I produce for and the writers, artists and playtesters that I work with. We managed to get some copies of Ogre Miniatures to the con in time to sell some . . . and sell some we did – over 150 copies! Ral Partha also did a brisk business with their complementary line of lead figures. Other hot sellers were GURPS Cyberpunk Adventures, GURPS Illuminati, and GURPS Middle Ages 1. Things have changed a little here at the office since our last issue. We have a new sales manager, Dana Blankenship (that's Loyd's sister), who comes into the position from Convention Liaison and Playtest Coordinator. She'll still be handling the convention duties, but playtesting has been passed on to our new office assistant, Lauren Hall. We also acquired a new Print Buyer, Derek Pearcy, who has been doing an excellent job, and a new Production Artist, Laura Eisenhour (you can see some of her illustrations in GURPS Bunnies & Burrows and GURPS Espionage). All in all, the year is winding down to be a good one. We've had lots of new, exciting products come out, and there are more to come. See New For GURPS for some more information. 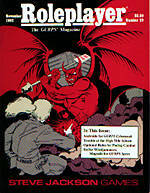 Roleplayer (ISSN 1050-3609) is published bimonthly by Steve Jackson Games Incorporated, PO Box 18957, Austin, TX 78760. Roleplayer, AADA, Illuminati, GURPS, Autoduel and the all-seeing pyramid are registered trademarks of Steve Jackson Games Incorporated. Other product names mentioned herein are trademarks of Steve Jackson Games Incorporated or their respective publishers. Copyright © 1992 by Steve Jackson Games Incorporated. All rights reserved. Printed in the USA.